The Football Association has produced new proposals aimed at improving England's prospects at major tournaments. The England DNA programme was unveiled on Thursday and has been inspired by models from Germany and Belgium. It has been billed as "the start point for the creation of a world-class approach of elite player development leading to winning England teams". The FA hopes to create a "golden thread" of joined-up thinking. BBC Sport's Mike Keegan, who was at the St George's Park launch, explains what the programme is all about. "The England DNA is the start point for the creation of a world-class approach of elite player development leading to winning England teams." So says the FA in the introduction to its 11-page document on the initiative. To cut a long presentation short, it is a new approach to coaching youngsters called into international squads from under-15 level until, hopefully, the senior XI. The plan is to ensure that coaches, training sessions and even style of play is replicated at every level. As FA director of elite development Dan Ashworth put it: "The only thing that should change is the size of the shirt." It has 'five core elements' - 'who we are', 'how we play', 'the future England player', 'how we coach' and 'how we support'. It started around a year ago when the FA's group of national coaches looked at what characteristics were necessary for a player to progress from the under-15 sides to the senior (male or female) squads. They looked at how they wanted England teams to play, how players should be coached and what could be done to support the process. From there, the views of the clubs, the Premier League and the Football League were sought, along with those of Roy Hodgson and his women's counterpart Mark Sampson. Methods used by seven successful nations were scrutinised, with attention paid to any correlations between the best-performing countries. From now on, those who win caps from under-15 level upwards will be asked to explore what playing for England means to them. They will also be given a wristband which features the England DNA values. The aim is make playing for England enjoyable and to ensure that, before making their bow for the senior team, the next generation of talent has experience of playing knockout football for the nation and living in a tournament environment. Yes - it even comes with a flash drive (for the kids). Hopefully a lot. 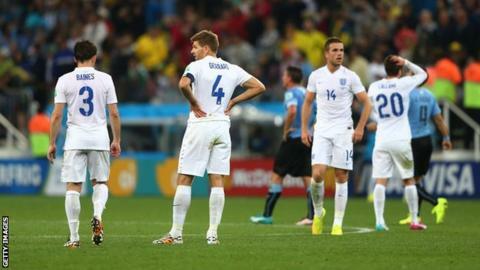 The FA says the national team has long been "characterised by our passion, fighting spirit and effort". That sounds a bit Mike Bassett but, while wishing to retain those characteristics, more focus will be placed on creative and technically excellent players from England's past. A playing philosophy has also been drawn up which will guide training programmes, meaning every session will have "70% ball rolling time". So everyone will be using the same formation? No. The formations will be flexible, but there will be an "England way". In possession, the national teams will aim to "intelligently dominate by selecting the right moments to progress the play and penetrate the opposition". Without the ball they will look to regain it "intelligently and as early and efficiently as possible". Eight "position specific" profiles have been set up where coaches can look at what attributes each role requires. Is this all about performance? No. Within the DNA comes social responsibility. The FA will prioritise "player education and life-skills". With words such as 'pathway', 'journey' and 'core principles' peppering the media briefing, it would be easy to dismiss this as laughable jargon. However, beneath the buzzwords lie a number of measures for which many within the game have been crying out for a long time. Expanding the variety of opponents at youth level should help ensure that nobody faces the likes of Brazil for the first time when playing for the senior team. And more time together at junior level has been seen as a factor in Germany's turnaround since 2000. You could be forgiven for thinking you have seen this before - and Ashworth was coy when asked what targets had been set, stating he wanted to see better performances at tournaments. FA chairman Greg Dyke, however, boldly said he wanted to see England win the 2022 World Cup. It could take as long as that for this football biology to be put to the test.